Record your Own Personalized Voice Reminders. This e-pill 5 Alarm Voice Interval Timer is designed for patients that start their daily medication routine at DIFFERENT TIMES each day and take their medications on a FIXED INTERVAL. You can record your own Alarm Message for each Timer or use default Beep Alarm. Five interval (count-down) alarm timers in one compact unit. 4) Press "START/STOP" and you're done! Pill timers run in parallel. Large Easy-to-Read Display shows the remaining time. You can play any of the alarm reminder messages at any time by pressing the corresponding button. When a timer is finished the pre-recorded reminder message is played for 30 seconds (after an initial loud 5 attention beeps). If no voice alarm / message is recorded, the beep alarm will sound for 35 seconds. Press STOP to acknowledge the alarm, then press RESET/CLEAR. 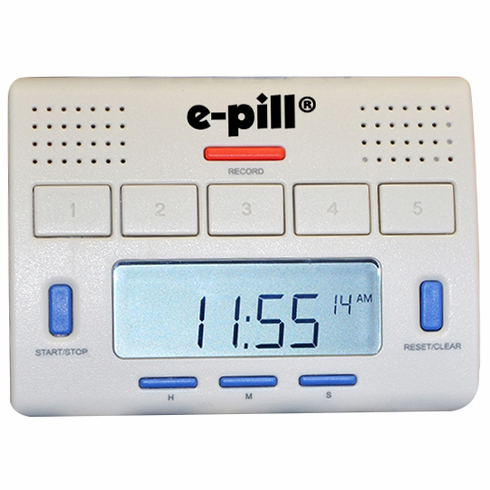 The e-pill 5 Alarm Voice Timer also works well as an �everyday� timer for today's busy world. Whether your timer is set to take dinner out of the oven or turn off a sprinkler your 5 alarm e-pill Voice Timer can be a handy device to remind you when a task is complete. "Every family should have one. Recording Time: Maximum length is 10 Seconds for each voice alarm. 5 voice alarms (one recording for each interval timer T1, T2, T3, T4, T5). Unique 'Missed Medication' count-up timer. Timer starts to count up after alarm sounds, if the start/stop button has not been pressed. This feature allows you to adjust your medication dose if you have missed the alarm by a long time. Warranty: 1 Year Warranty. 30-Day Money Back Guarantee.